What It Is: A collection of paper dolls inspired by some of the literary world’s greatest authors. In general, themed paper dolls like this have been making a resurgence. Whether they’re actually played with or just a fun way to celebrate someone’s interests is up to you. This set in particular is fun though, because let’s be honest, writers aren’t typically known for their stellar style (present company excluded). 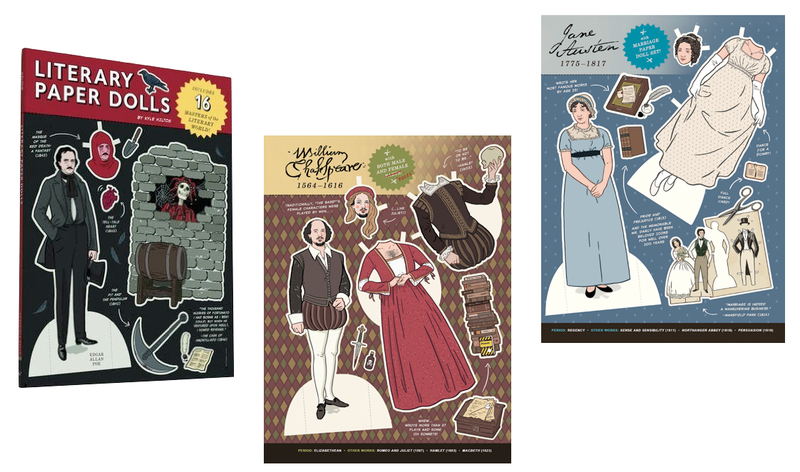 Featuring 16 famous faces like William Shakespeare (who can be dressed in drag) and Harper Lee, the set also includes fun callouts to the authors’ stories, time period, and key works for those looking to go deeper. Who It’s For: Your librarian friend, to celebrate her new job. Your wife, to commemorate her love for the classics. Your niece, to introduce her to some of the literary greats. BONUS entry into last week’s China Rich Girlfriend giveaway – tell me in the comments below, what do you think of this fun gift idea? Any paper dolls you’d love to own? I really don’t have anyone that would treasure this idea. This one is not for me! It would be a good gift. I might even enjoy it if it suited my interests! Nope, although I would have loved these as a child they are a no go for me. This are super cute! I would love the Poe doll and I have a friend who would love the Shakespeare one. I use to play paper dolls many years ago! I am sure my granddaughter love love them! I love this idea! I think they are a step up from your regular paper dolls. If I had children, this would be something I would definitely buy. I think this would make a great gift – I remember fondly playing with paper dolls when I was a young girl. Well, if adults are now into colouring books, I’m sure paper dolls can be the next big thing. They might be fun to use with a language unit in a classroom. I don’t think I’m a fan of this gift idea! Not for me. My kids would like it though. I loved paper dolls as a kid, I think Jane Austen would be fun to share with my Grandaughter.